Coerver Coaching ACT recently caught up with Coerver Coaching ACT Kid Zac Barbatano on his time at Coerver Coaching/Benfica International Elite Development Program. CC. What have you enjoyed most about your time at Benfica so far? ZB. There have been so many enjoyable moments throughout this trip. The experience of being placed in a professional environment with others around the world has been incredible. The footballing level has also been amazing and I feel I have made some big improvements in my game both on and off the football pitch. Having the opportunity to train with world class coaches at excellent facilities has also been an amazing experience. CC. How has Coerver Coaching ACT prepared you for your time at Benfica? ZB. Coerver Coaching ACT helped me improve my football technique from a young age. Like anything in life you get out what you put in. I am at a stage that moves I do on the pitch are just second nature to me. Portuguese football is very technical and fast so if you have poor technique you will be found out very quickly. CC. What have you learnt at Benfica both on and off the field? ZB. Throughout my time at Benfica I have learnt that a professional footballer must do everything that is necessary in order to succeed both on and on the pitch. Nutrition, preparation and intensity on the pitch must have 100% effort put into it in order to unlock a footballers potential. CC. What is the biggest challenge you have face at Benfica? ZB. The biggest challenge I have faced at Benfica is continuously maintaining the right intensity when in training, injury prevention and stretching sessions. This is because it does become quite tiring when training and daily monitoring is done on a regular basis. As well as not being used to this much training back in Australia. However, as the days went on, my body and mindset adapted to the load and I was putting in my best effort in every session. CC. What advice would you give to young Coerver ACT players who would like to go and train at Benfica? ZB. There are no short cuts in football. You have to work every day and not only when you are at formal training sessions. Having the ball at your feet and practicing ball skills is continuous development in football. It is not an accident that most of the best players in the world are also the hardest working. Focus on short term goals and you will be ready when opportunities come you way. CC. Whilst Coerver Coaching is a global technical skills training method it is also provides pathways for players after they have completed their time at the program. How have you benefited from this. ZB. Coerver coaching has significantly helped my technical skills throughout my footballing career and has shaped the player I am today. Despite finishing the program a few years ago, I feel it has opened new pathways for my footballing career and has exposed me to a professional environment. I would say I have certainly benefited from this experience and will continue to for the remainder of my time at Benfica. 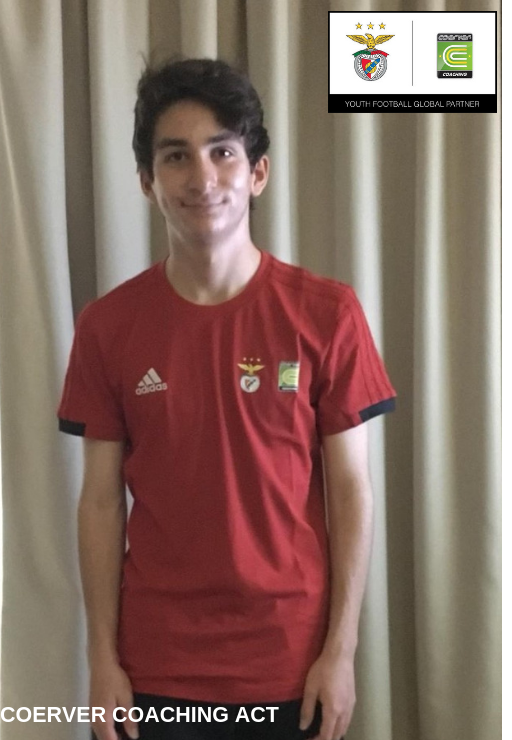 From all of us here at Coerver Coaching ACT we wish Zac all the best for the rest of his Coerver Coaching/Benfica International Elite Development Program experience.